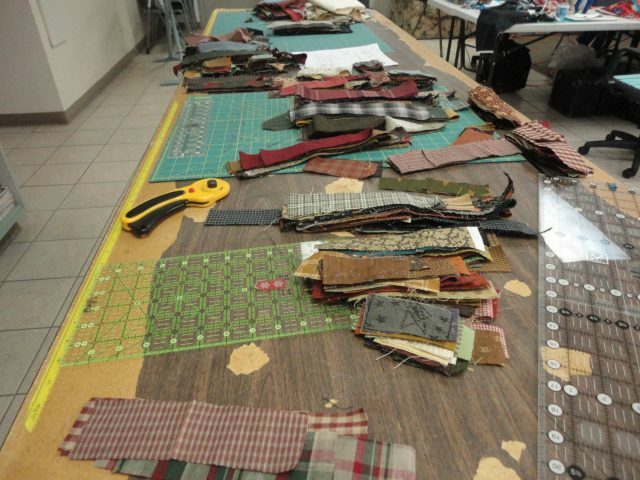 It all started with a garbage bag full of scraps. 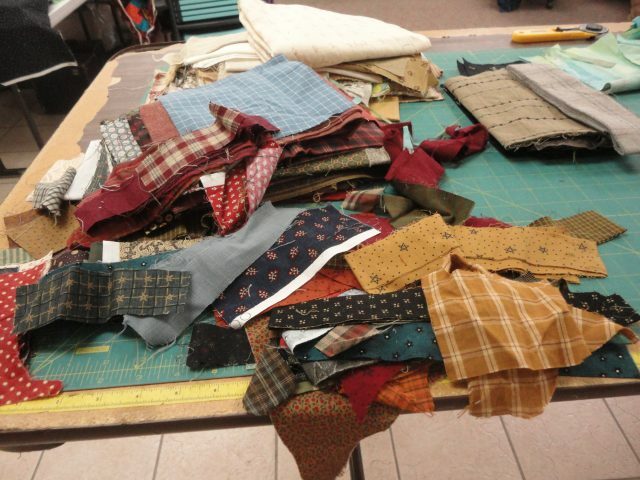 Thousands of scraps. This is a tiny stack of them. 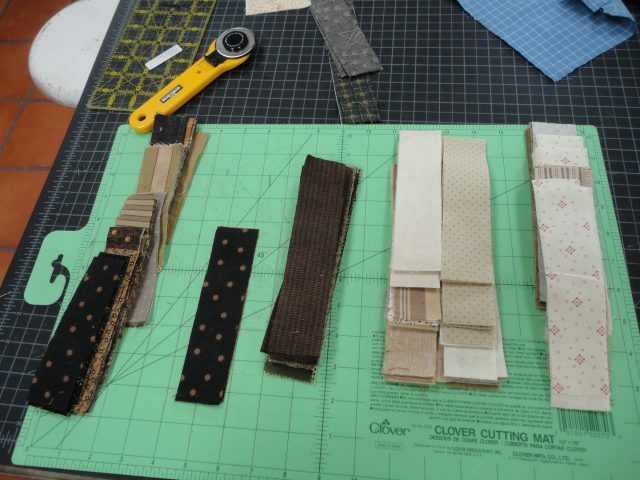 I laid them out, processing each of them into the maximum length and width to be the most efficient. 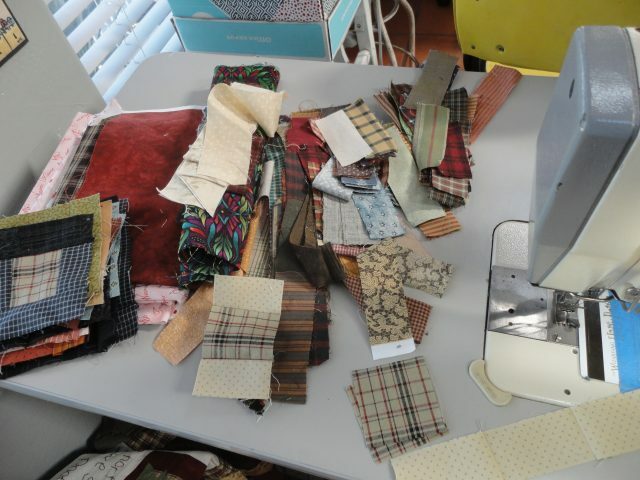 I put them into piles to make assembly line sewing faster. I stacked them up next to my sewing machine and went to town. After the addition of each log, I took them to the ironing board and pressed them. 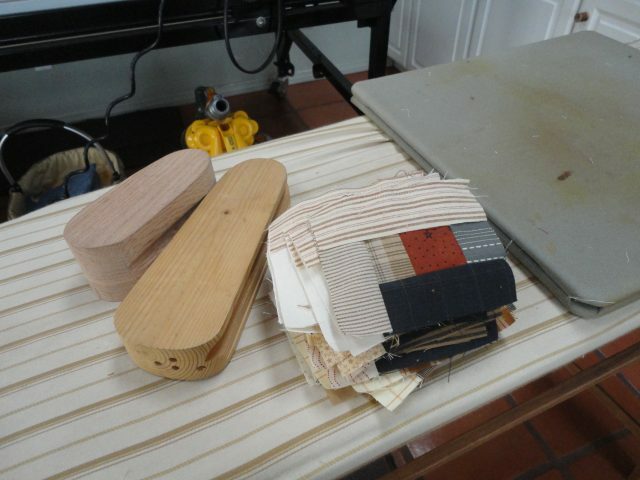 The wooden tailor’s claps rested on top of the pressed block to help flatten the seam. Slowly, but surely the stack of 7″ finished log cabin blocks grew. I have about 80 done here. 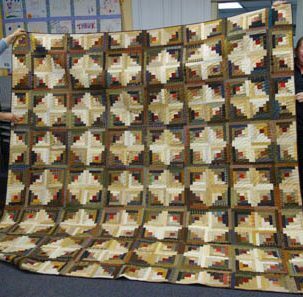 I thought I was nearly done, but I re-figured what I needed to make a king sized quilt, and I came up with 194 blocks. Whew. I’m not even half way done! 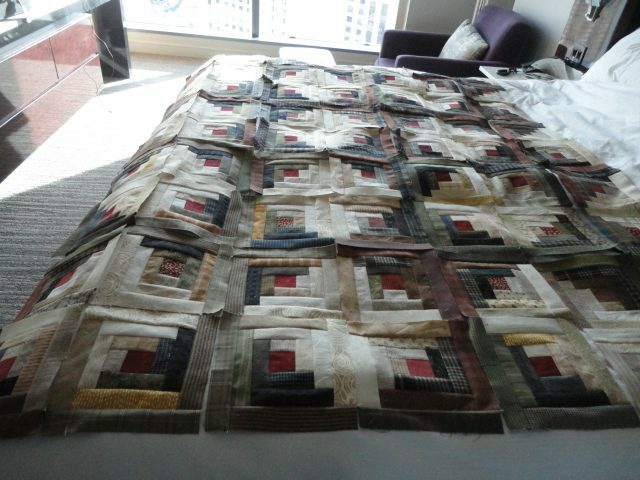 I couldn’t wait, so I laid them out on the bed and stood back to admire the quilt in progress. I finally got them all together and put it on the long arm to do the Baptist Fan pattern on the quilt. It is a timeless motif. And here it is done! It’s huge! No borders, just log cabin blocks. It measures 104 x 104. SO. You think I would have used all the scraps, right? Wrong. They multiplied when I turned my back. 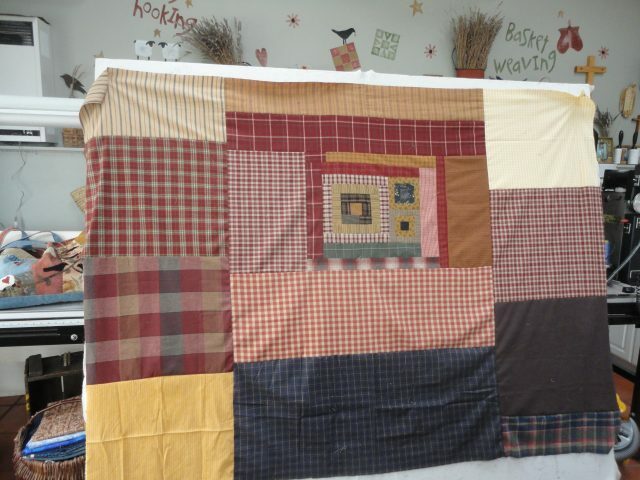 I decided to make another quilt with a modified log cabin, where the center is surrounded on 4 sides by another color. Here’s the back side to show that I pieced the logs as much as I needed to to fit the block, and I used colors that were similar if I didn’t have enough of one. I made 2 sizes of blocks, 6″ finished and 12″ finished. Some light centers, some dark centers, anything goes! Then I put them up on my design wall, and I thought it looked pretty good. 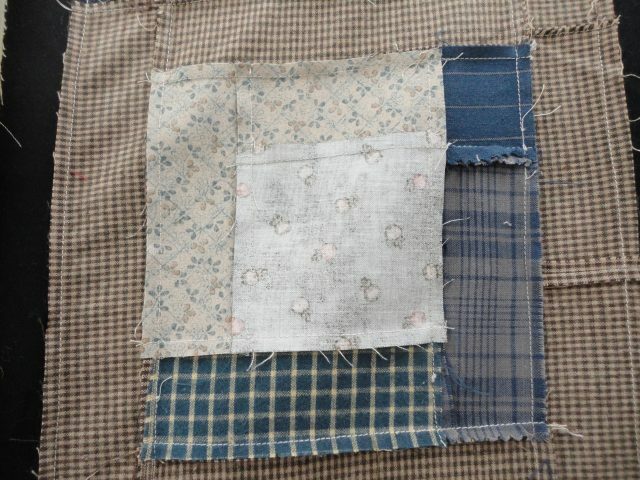 Here’s the back again to show how I had to patch in 3 pieces of fabric to finish the block. I’m all about using up every thread of fabric! After all blocks were sewn, I had to make a back. I went right to the stash and pulled out some 15+ year old fabric that worked perfectly for the scrappy look I was after. I quilted it with my favorite Baptist Fan pattern. 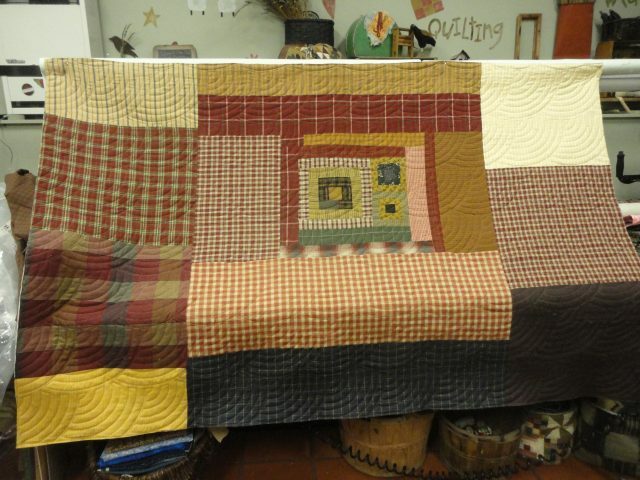 See how the quilting pulls it all together? And now it’s done! I don’t have a picture of it with the binding on, but it looks fabulous. 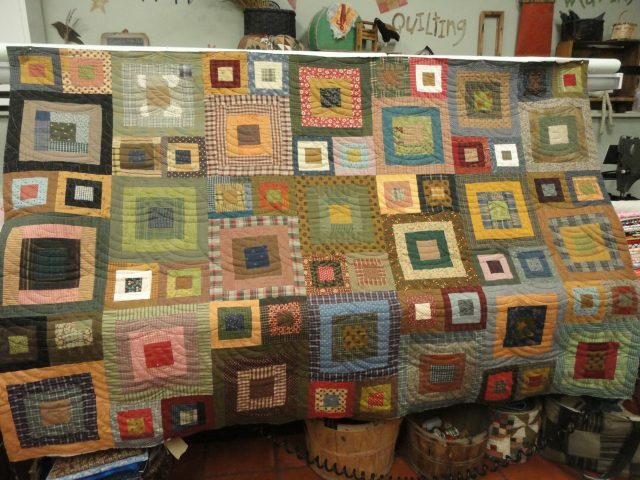 Oh, I used 100% wool batting in both of the quilts, and it is just heavenly. Do you think I tackled all the scraps? NO. When I wasn’t looking, they multiplied. I have about 1/2 a shopping bag full of scraps. I need to break them down into like units and make another quilt. You my friend are a genius! 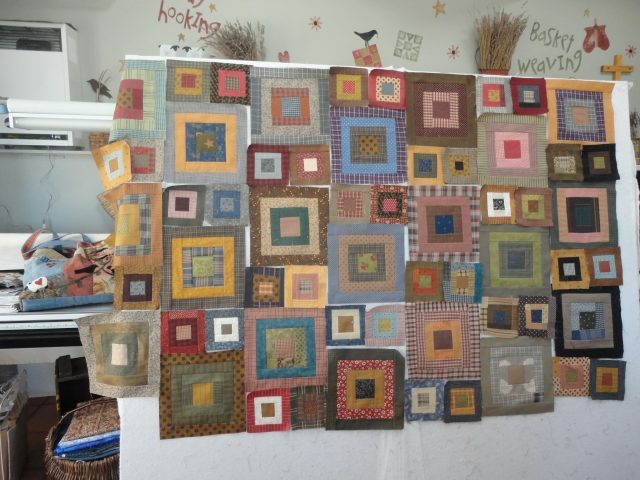 Since I am not a genius, I am going to copy your block quilt with different size blocks. I just love the look of it. 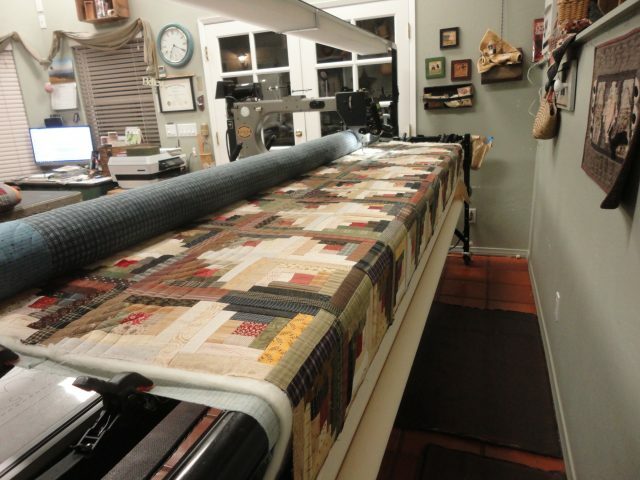 The best part…..you don’t need to make quilt all at once. They are both beautiful! To see them go from scraps to finished is a treat! You’re back! So happy to see your post! 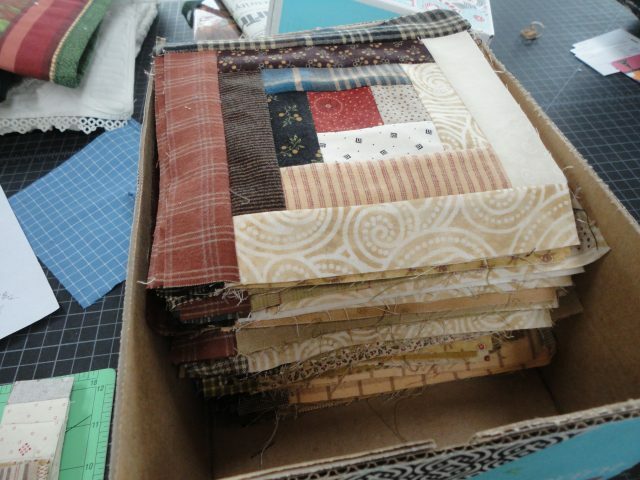 And what fun, scrappy using up projects. Loved your post about the projects. Thanks, everyone! 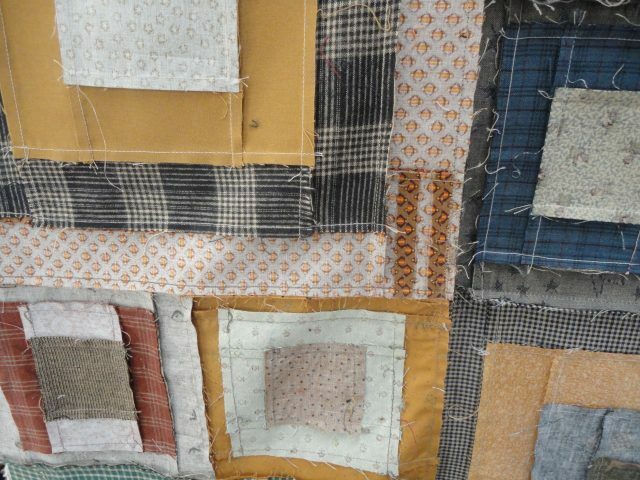 I am inspired to keep on quilting! I have multiple log cabin settings to share with you next time!